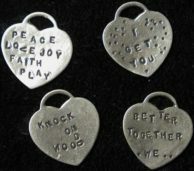 View cart “PEACE LOVE JOY FAITH PLAY” has been added to your cart. This little group of charms celebrates my love of poetry, e e Cummings, and favorite sayings. All done in sterling silver. Approximately one inch in size overall.